One hot day, a little boy named Teddy Jones freezes at the sight of a brand-new ice cream shop.On his request, his mom takes him to get a treat. While thinking about what kind of ice cream to select, the waiter crowns him with a golden paper crown. Zoom! The Ice cream king(Teddy) enters his kingdom. Teddy's Ice cream Kingdom has whipped cream lanes, Ice cream mountains and a ice cream fountain, his castle is made of chocolate halls and mint-chip ice cream walls. After wandering through his kingdom, He blasts off in his spaceship up to the ice cream moon past the ice cream meteors. He goes fishing for nuts and cherries in an ice cream sea. He enjoys the Ice cream festival, ice cream hot air balloons and volcanoes that erupt vanilla fudge! Suddenly he realizes, that he is all alone in the kingdom! Ice cream tastes better when you share it with someone. He removes the crown and returns to the real world. He selects a banana split with two spoons. One spoon for mom and one for him. The delicious, yummy adventure is pictured with vibrant illustrations and delivers an awesome message of sharing. The transition in Teddy's world from real life to ice cream kingdom is beautifully illustrated - The real world is somber with minimum colors whereas Teddy's kingdom is colorful. In the month of April, We had participated in the Tissue box challenge conducted by the Activity mom and Jdaniel4mom and Earth day bird got us a second prize. We received a set of three paper back books from Tiger Tales books. 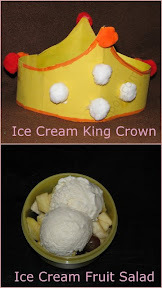 one of them is Ice cream king. CJ's favorite treat is ice cream and so she enjoys reading the Ice cream king. Fold the Construction sheet in half as shown below. Measure head circumference of your kid by wrapping the cardboard around the head. Adding cardboard behind the paper was such a smart idea! Your sundae looks wonderful too. What neat ideas! Your ice cream fruit salad looks delicious!